Im a league bowler who at the time when I bought this used 3 balls and had league once a week as well as bowled recreationally 2 or so times a week. This is a good case if you are ONLY storing balls. If you are using three balls and are considering getting this case, I would strongly advise don't. There are no accessory pouches and absolutely no room for shoes if you use all three ball compartments. Its strap also really easily gets caught under the wheel and causes the strap to wear down. As much as I love hammer products (my four balls are all hammer), I would stay away from this case and their rollers as they seem to be of lower quality, this one being no exception. If you are using 3 balls in your arsenal, then you are a serious enough bowler to where you deserve a better roller than this. Look at Brunswick or KR lane lovers products, they're usually of much higher quality. Hi Mike, We don't have the specifics but this bag is meant to be around 5lbs. So it is entirely possible that the bag plus your three 15lb balls will total over 50lbs. Yes, the roller will have clips to clip on the shoe bag. Is the side on this bag still clear? There will be a clear top to be able to view easily inside but there is not a clear side. The promo code will be 'instant5'. 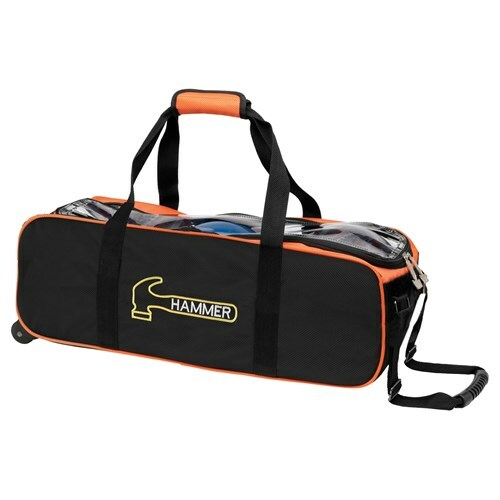 Due to the time it takes to produce the Hammer Premium Triple Slim Tote/Roller Black/Orange ball it will ship in immediately. We cannot ship this ball outside the United States.